At the time of deploying the AWS Multi-Tier Solution, ensure that the “SSH Source” field in the “Networking Configuration” section is set to “0.0.0.0/0”. The default setting for the template is set to “127.0.0.1⁄32” which disables remote SSH access; change this value to enable SSH access to the application server. Browse to the AWS CloudFormation dashboard and select the stack for which you wish to enable SSH. From the “Actions” menu, click “Update Stack”. You will be prompted to update the stack. Click “Next” until you arrive at the “Specify Details” page. Locate the “Networking Configuration” section on the page and ensure that the “SSH Source” field is set to “0.0.0.0/0”. Continue clicking “Next” until you arrive at the final page. Preview your changes and verify that the security group is scheduled for modification. 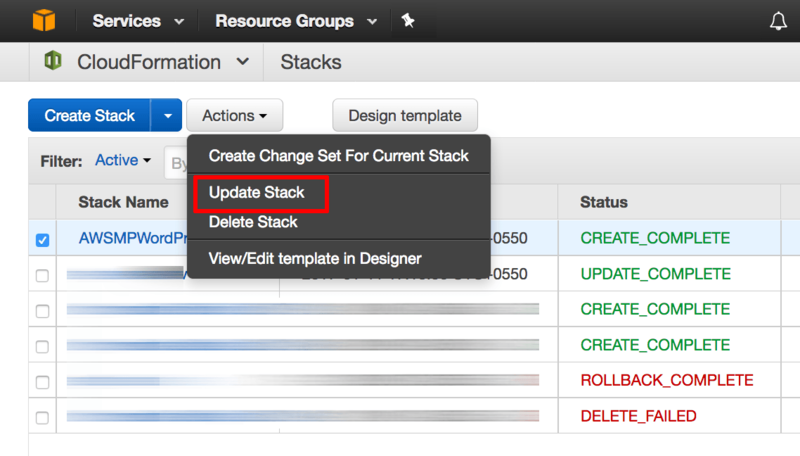 Click “Update” to update the stack and enable SSH access to the application server.